‘Having a smaller, more intimate space like the Linbury Studio Theatre at the Royal Opera House offers us many different opportunities in addition to The Royal Ballet’s work on the main stage, where both heritage is celebrated and the art form of ballet is developed,’ says Emma Southworth, Senior Producer of The Royal Ballet Studio Programme. Visiting companies form an important part of The Royal Ballet Studio Programme – which programmes the dance in the Linbury and produces choreographic projects. This week alone has seen Springboard companies Ballet Central (Central School of Ballet), Verve (Northern School of Contemporary Dance), Rambert School of Ballet and Contemporary Dance and Dutch National Ballet Junior Company take to the stage in the Linbury. 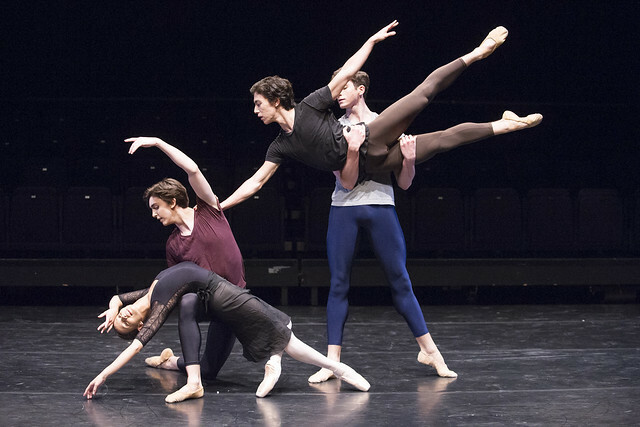 Following their performances, the Junior Company will remain at the Royal Opera House for a four-day, choreographic workshop. Exploring new choreographic projects like the Dutch National Ballet Juniors’ workshop is a key part of the programme’s drive to find and nurture new choreographic talent. Draft Works, a forum for new work curated by Wayne McGregor and first staged in 2007, offers dancers the opportunity to perform short choreography still in the making. Next Season also sees an exciting range of productions on the Linbury stage. Visit our Autumn Season page to find out more about the productions on stage in the Linbury Studio Theatre for 2015/16.